The author has written one hundred and thirty paragraphs of glory and adoration of Siva and thirty paragraphs of devotional prayer. These are original, elevating, thoughtful and written in English with Hindi version. Adoration of Sakti is quoted from celebrated ancient texts. To this is added some selected verses of laudation and prayer from sacred scriptures and the excellences in master pieces of a few famous and momentous stotras from well-known devotee-poets, with their English and Hindi versions, which is a unique feature of the book. 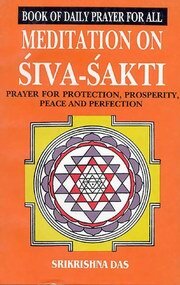 All this makes it is a daily prayer book for all, for attaining peace, prosperity, protection and perfection. "Prayer for protection, prosperity, peace, and perfection."